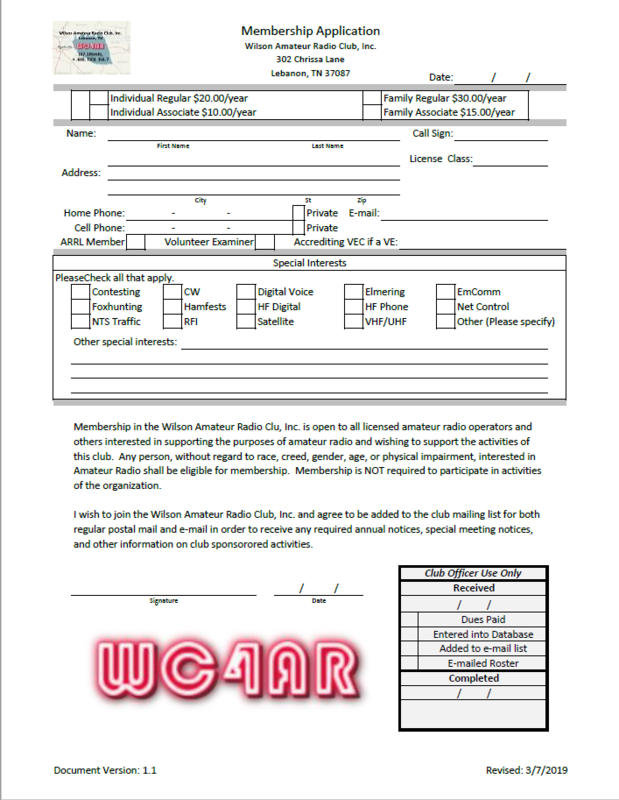 It is time to renew your membership in the Wilson Amateur Radio Club. We will have member information sheets for you to review and fill in any missing information at our January 5, 2019 meeting. We ask that all members please fill these out to help us identify areas of interest to our membership and work to have more programs of interest to our members, obtain required information for ARRL Affiliated Club status, and a member directory. We will be working on some exciting changes in 2019 and sincerely want to have you be a part of them as we move the club forward and work to enhance it. If you cannot attend our next meeting on Saturday, January 5, 2019 at 6:00 PM in Room 122 of Labry Hall of Cumberland University we will be mailing your renewal form for you to complete and return to us along with your dues for 2019. If you do not wish to renew your membership at this time please let us know at n4maw[at]arrl.net so we can mark you inactive. You will remain on our roster as an inactive member until 31 Dec 2019 and removed from the roster completely on January 1, 2020. Wilson Amateur Radio Club, Inc.
With a new year upon us once again it is time to update our calendars with meeting and VE Test session dates, times, and locations. Please note the following dates and times on your calendars. HamQuest 2019: Saturday, July 27, 2019 Opens at 8:00 AM at the James E. Ward Agricultural Center, Lebanon, TN. 5 January 2019 – 6:00 PM in the Room 122 of Labry Hall on the campus of Cumberland University in Lebanon, TN. NOTICE: Unless otherwise noted, the Wilson Amateur Radio Club will hold its monthly meetings, and conduct all VE Test sessions, in Room 122 of Labry Hall on the campus of Cumberland University in Lebanon, TN. IDENTIFICATION: You are required to provide sufficient identification to prove your identity. A legal photo ID and/or other formal photo IDs such as driver’s license, passport, government ID, work ID, school ID, etc. will serve as sufficient identification. Bring at least two forms of identification. Persons without photo IDs must bring two alternate forms of identification. For example: non-photo ID, Social Security Card, Birth Certificate, employment ID, school ID or report card, bank statement or other business correspondence that specifically names the person and includes the mailing address shown on FCC Form 605. OTHER INFO: Applicants upgrading must bring the original and a copy of their current license. You will also need a photo ID such as a driver’s license, work ID, school ID, etc. (as noted above). 6 October 2018 – 6:00 PM in the Room 122 of Labry Hall on the campus of Cumberland University in Lebanon, TN. 1 September 2018 – 6:00 PM in the Room 122 of Labry Hall on the campus of Cumberland University in Lebanon, TN.